31 October 1517 Martin Luther nailed his 95 theses on the door of the Castle Church in Wittenberg. It marks the symbolical beginning of the Protestant Reformation. His translation made the Bible available for the general public. On 31 October 1517 Martin Luther (1483-1546) attacked the abuses of the Roman Catholic Church by nailing his 95 theses on the door of the Castle Church in Wittenberg. This bold gesture of five centuries ago launched the Reformation, which is commemorated in the Luther Year 2017. Leiden University Libraries contributed to the Luther Year with an afternoon seminar: ‘Before and after Luther. 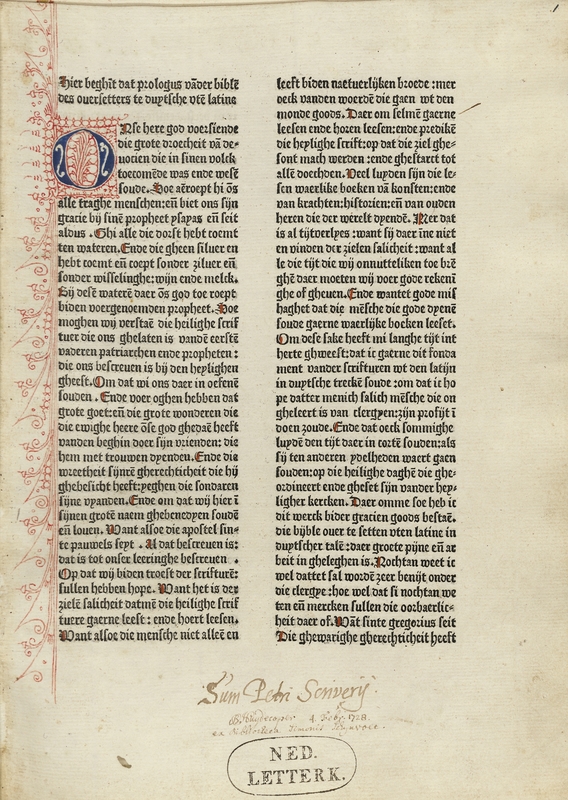 Bibles translated, printed and preserved in Leiden’ on 27 October. 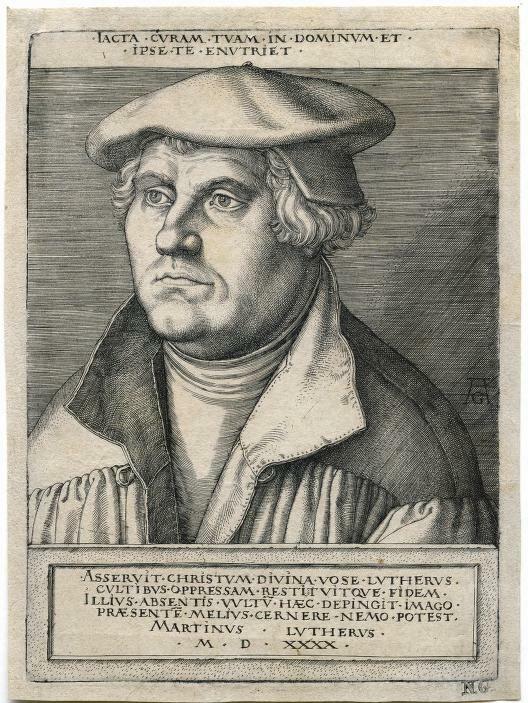 Luther started out as an Augustine monk, but became the leading figure of the Reformation in the German lands after his appointment as Professor of Moral Theology at the University of Wittenberg in 1508. The publication of his theses against the trade in indulgences on 31 October 1517 marks the symbolical beginning of the Protestant Reformation. Luther is also known as a Bible translator, who is said to have made the Bible available for the general public with his German edition of the New Testament in 1522 and a complete edition of the Bible in 1534. The seminar ‘Before and after Luther' not only focused on Luther’s own translation, but also paid attention to Dutch translations and editions of the Bible prior to and following Luther’s translation. The emphasis is on Leiden, where the Bible was translated and printed throughout the centuries, and where numerous copies have been preserved in the University Library. One of the Bible translations made in Leiden is that of the famous States Bible (‘Statenbijbel’) issued by the States General, which decided that the translators had to live in Leiden, where they would be able to complete their work properly. The first copies of this bible were also printed in Leiden, in 1637, by Paulus Aertsz van Ravesteyn for the widow of Hillebrant Jacobsz van Wouw who acted as publisher. A later translation also made in Leiden has become known specifically as the Leiden Translation, for it was made by the Leiden theologians Abraham Kuenen, Willem Hendrik Kosters en Henricus Oort between 1899 and 1912. The Old Testament appeared at Brill between 1899-1901, the New Testament however, was printed between 1911-1912 at Zaltbommel. So some of the Leiden translations were also actually printed in Leiden; but also other translations came from Leiden presses. Such as a New Testament printed by Peter Claesz. Van Balen in 1542, or the Deux-Aes Bible, which first appeared in Emden in 1562, by Jan Paedts and Jan Bouwensz between 1581 and 1614. 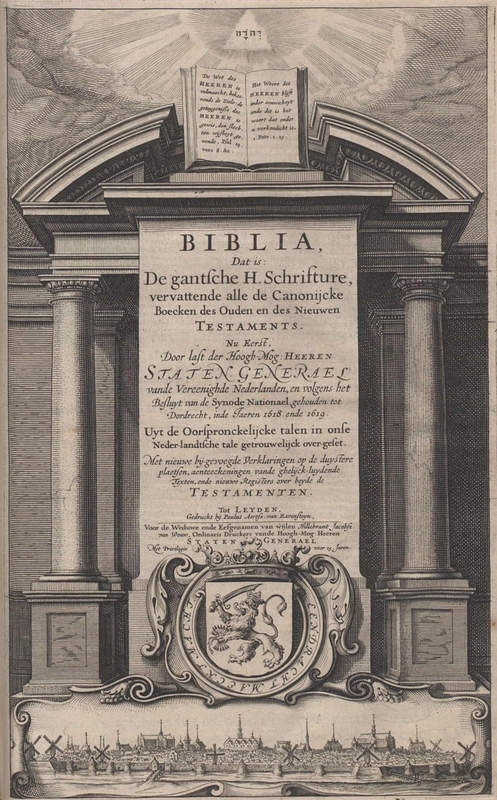 Also well-known Leiden publishing houses like Plantin and Elsevier regularly printed bibles, including numerous Greek New Testament editions between 1591 and 1641. Leiden University Library holds copies of most bibles printed in Leiden, but also of copies of other Bible translations made in the Netherlands. One of the earliest to appear in print is the so called Delft Bible, which was printed in 1477 in Delft by Jacob Jacobszoon van der Meer and Mauricius Yemantszoon van Middelborch. The UBL holds two copies of this Bible, of which one with an interesting late fifteenth century owners inscription. And of course, also Luther’s own translations can be found in the collections of the UBL, such as his first translations in German, but also Dutch translations of these, which were mostly published in Antwerp in the years between 1526 and 1542 by printers such as Jacob van Liesvelt and Willem Vorsterman. Leiden has a rich tradition when it comes to translating and printing the Bible. This is reflected in the collections of the UBL, where most of these bibles can be found, as well as numerous other translations and editions.